I probably say this every Friday but I'm thrilled the weekend is here. I still have catching-up to do plus I have to gear up for what promises to be an even busier week next week. And in between all that we will go to the museum, go to some birthday parties, celebrate our wedding anniversary and plant a little tree. 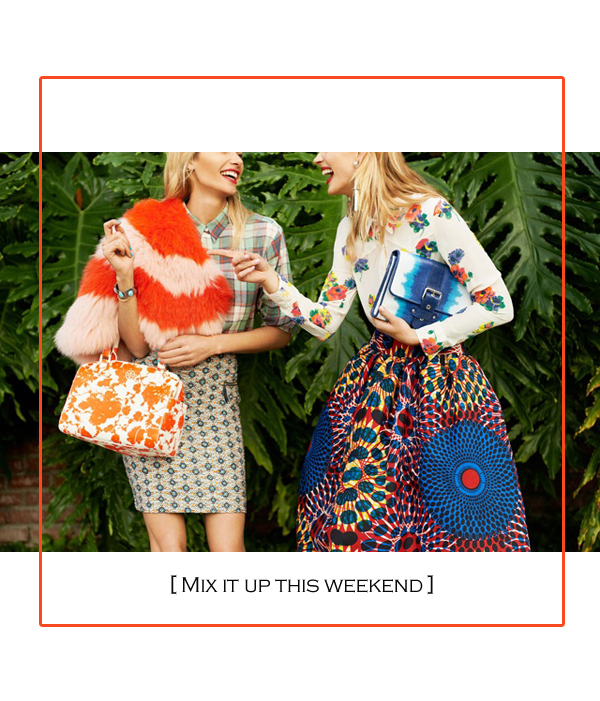 Mixing it up is the best way to go. || House Beautiful. I was so honored to be featured in House Beautiful's Top Blog Posts of the Week last week alongside great company like Lindsay from Sadie And Stella. See here. || Live Laugh Decorate. The sweet Nicole from Live Laugh Decorate included one of my peak pillows on her fabulous Houzz article about how to add color to a room without major commitment. Her answer- change your pillows! Read the article here. || Little Green Notebook. Jenny did the most amazing and comprehensive feature on malachite and included my box DIY here. -for mentioning my little blog. I'm truly honored. || I loved this DIY from The Vault Files because it is adorable and easy. I think it would be ideal for a little gift for a friend or for as kid's birthday party favor. || I wanted everything in The Now Stylebook's Lust list. You will love the zebra stationery and the pineapple sandals. || I got these cute sandals from Zara after seeing them on my most fashionable friend. I could not stop thinkin about them after seeing them in her cute feet. And these were on the next shelf. It was a spur of the moment decision. I grabbed them as well and went. Love this image! Also loved being next to you on HB this week. True honor! Love your link love! awww. Thanks lady! As I keep saying, you're on fire! Kudos especially on House Beautiful. Hella major. But even bigger kudos on your wedding anniversary. Quite the milestone. Cheers to a fab weekend. Congrats on House Beautiful! So fun! In LOVE with those Zara sandals. Perfection. wow congratulations on the HN feature! so well deserved mention! Good for you girl. So many good things happening for you. Well deserved. Congratulations on the recognitions! And, thanks for sharing the great links! Couldn't agree more on the weekend finally being here! You are so talented...and everyone is finding out. Going to check out the links. Congratulations! You are a true talent! Many more features to come! Such a big blog week for you! You deserve it lady - congrats! Congrats on your House Beautiful mention! So exciting - and well deserved. Wow all those great features... You totally deserve it Albertina!!! So congratulations and have a great weekend! And congrats on the House Beautiful mention- how amazing! Congratulations on your fabulous press!!! And I love that image!